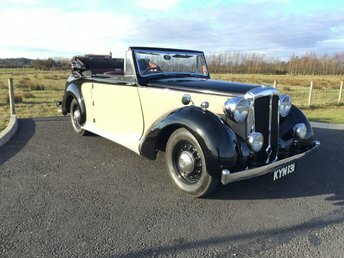 VSL are proud to offer for sale this charming 1949 Daimler DB18 Barker 2.5ltr 6cyl Pre-Selector 3 Position Drop Head Coupe. Finished in Cream over Black with Brown Leather Trim and Matching Black Hood, this stunning motorcar really is a head turner, it runs superbly and the Wilson Pre-Selector Gearbox is quiet and smooth. The bodywork is in very good order and the interior also, two new front seat base squabs have been recently done and all is well. The old "buff log book" is with the car along with a very nice history file showing some lovely documentation and invoices to match for previous work etc. Handbooks, Maintenance Books and even an original sales brochure complete the file. This car has just had an MOT test and has passed showing just 26 miles covered in the last 12 months. The car shows three former keepers, the previous keeper owning it for the last 32 years. This is a very rare car and offers a superb opportunity for someone to own a enjoy a truly usable classic Daimler. Get the best deal on a used Daimler Limousine car for sale in Garstang by making your way to VSL today. You will find every available model listed here on the website, and as all our stock is competitively priced you should have no problem sourcing a pre-owned Daimler to suit your budget. Take the opportunity to browse our current range online before contacting a member of the showroom team to find out more. Our friendly and knowledgeable staff will be more than happy to answer any questions and provide advice and guidance when necessary. Alternatively, why not pay a visit to our showroom in person and take a closer look at the selection of used Daimler Limousine car models for sale.